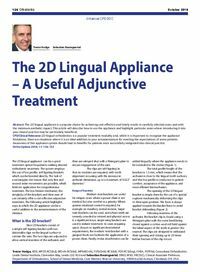 Abstract: The 2D lingual appliance is a popular choice for achieving cost-effective and timely results in carefully selected cases and with the minimum aesthetic impact. This article will describe how to use the appliance and highlight particular areas where introducing it into your clinical practice may be particularly beneficial. Clinical relevance: 2D lingual orthodontics is a popular treatment modality and, whilst it is important to recognize the appliance limitations, there are situations where it is an ideal addition to your armamentarium for meeting the expectations of some patients. Awareness of this appliance system should lead to benefits for patients once successfully integrated into clinical practice. Author notes: Trevor Hodge, BDS, MFDS RCS(Ed), MOrth RCS(Ed), MPhil(Orth), FDS(Orth) RCS(Ed), FDS RCS(Eng), FHEA, FDTFEd, Consultant Orthodontist, Leeds Dental Institute, Clarendon Way, Leeds LD2 9LU and Sebastian Baumgaertel, DMD, MSD, FRCD(C), Clinical Associate Professor, Department of Orthodontics, School of Dental Medicine, Case Western Reserve University, 10900 Euclid Avenue, Cleveland, OH, USA. Objective: To demonstrate how 2D lingual orthodontics may enhance a clinical practice.